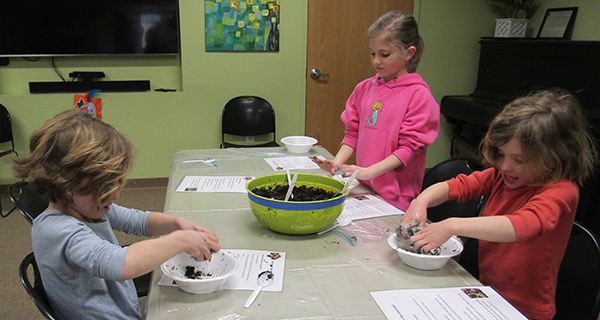 Kids and their parents worked hard to make seed balls that they could plant in their own yards this year. 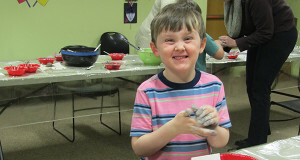 Jeremiah, 5, smiles as he makes his seed balls. March is typically the month in which people begin preparing garden for the summer. They decide on the seeds or bulbs they’re going to plant, begin picking where they will put new flower beds, and choose when they should start planting. It’s when gardeners begin working hard to make sure their plants will survive through spring and into summer. On Wednesday, March 20, the Dover Library was treated to its own sort of gardening club. Children and their parents were invited to make seed balls to plant in their yards so that the kids could start learning all about gardening. Kids came to the event ready to get messy, and the librarians were prepared. Tables were set up, covered by protective plastic so the children could be as hands-on as they pleased. Each station had a bucket filled with clay and another bucket filled with soil, along with some bowls containing the seeds of different types of flowers. A laminated sheet instructed the children how to make their seed balls. Each child approached the buckets and dug out two scoops of soil and four scoops of clay. Then, they mixed them together until the soil and dirt looked like melted cookies and cream ice cream. “Knead it like dough. Really get in there. Mush, mush, mush,” advised event organizer Angie Howes on the proper method to make the perfect seed balls. Other kids added a little water or added some more soil to their mixture to get the right consistency for their creation. “Today is the first day of spring,” said Howes. “I thought it would be fun to have the kids get their hands dirty.” The children had three different seeds they could put into their seed balls: red poppies, blue wildflowers, and marigolds. After mixing the clay and soil together, the children flattened the balls into pancakes so they could add seeds. “Jasper, come help me choose your seeds,” said one mom. Jasper promptly answered that he needed to wash his hands, which were covered in the soil and clay mixture. Once his hands were clean, Jasper went right to picking out his seed mixture. The kids could choose one, or two, or all three types of seeds to put into their seed balls. Some tried to put a lot in, before learning that adding so many seeds would actually stop the flowers from flourishing. Emma, Brit, and Morgan Madison work hard at making their soil and clay mixture for their seed balls. By the end of the event, all of the children left with at least five little clay balls, each filled with flower seeds. They could go home and immediately plant them, or they could store them until they were ready. The kids who plant their seed balls immediately will see their own bloom in just a few short weeks. Bright red poppies, shocking blue wildflowers, and sunshine yellow marigolds are sure to add a pop of color to any yard - then the hard work will really begin, and these new gardeners will have to ensure their flowers will stay alive.